Tagline: When was the last time you 8? 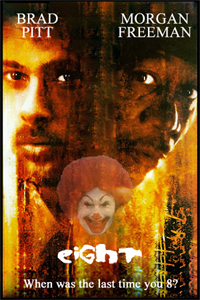 Synopsis: Finally retired detective William R. Somerset (Morgan Freeman) and recently acquitted former detective David Mills (Brad Pitt) are hired by a rival food chain as private investigators, to the figure out the competition’s “secret sauce” but what they find will take them to the darkest depths of the fast food business. Memorable Scene: A moving moment, where William Somerset has to convince his partner David Mills to let go of the guilt he feels over his wife’s murder. Somerset pleads with David to stop carrying around his wife’s severed head in a box and sleeping with it at night. Plot: Somerset has opened a business doing private investigating after retiring from Homicide. He hires Mills as his assistant, but warns him that this could be a very dangerous job. But Mills is no rookie to danger. He responds to Somerset’s warning by saying “You and I worked homicide for years. What makes you think we can’t handle an fast-food investigation? We’re gonna walk in there, ask them for the recipe, and be back here in time to watch Dancing with the Stars”. But the old man knows better. “Don’t be so sure David, this is a crazy business. People die over less.” Somerset warned. “Yea, I’m gonna die of starvation if we don’t get our asses down there already. Let’s go” Mills replied. They head down to the scene: McDonald’s. “Welcome to McDonald’s, May I take your order?” asked the attendant. “Yea, let me have a Quarter Pounder with cheese, some fries, and a…” Mills is cut off mid order by Somerset, who begins questioning the cashier. Sparing no time Somerset gets right to the point, “Listen, is there any way you could tell us the recipe for your Big Mac sandwich?” he then slides the girl a five dollar bill. The cashier’s eyes grew wide and her skin pale. “Well Mister, I can only tell you there are 8 ingredients, just eight. Now leave, please. Leave before it’s too late.” Mills quipped, “Yea, they might spit in my Quarter Pounder”. Somerset interjected, “Damn it Mills can’t you be serious for once?” He then turns back to the cashier and asks her one last question. “Can you tell us anything else, anything at all?” but it’s too late. Before Somerset can even catch his breath, four men dressed as Ronald McDonald, grab Mills and Somerset, and throw them out of the building. Somerset and Mills have infiltrated McDonald’s main headquarters and are about to enter the Big Mac preparation room. “This is it, Mills. Remember what I said, stay cool” warned Somerset. “I got this.” Mills said as he kicked in the door. The room is filled with tanks and tanks of the special sauce and foul almost putrid odor. The tanks are so large Mills and Somerset feel dwarfed by their height. They slowly make their way towards the back of the room. Then they hear something coming from a room marked private. It’s sounds like people screaming. They run towards it. “There!” yelled Somerset, Oh No!” “What the hell is he doing?” Mills wondered. “Mills, go away from here!” screamed Somerset, “Go away, now!” Mills refused and moved forward. Somerset can’t believe his eyes. Inside the private room is a midget wearing a Ronald McDonald costume feeding former McDonald’s employees into giant food processors. The processor leads right into the “special sauce” tanks. “No!” Mills screamed as her drew his gun, “No! I can’t… I ate…” “Mills, just walk away, don’t you understand if you kill him, he wins?” “Yes detectives, you have experienced the 8th ingredient. How did all those employees taste going down?” The midget smirked. “This is what happens when you dig your nose too deep down the rabbit hole. Now you must kill the source. Shoot me!” screams the midget. “Oh God, No” Mills cried. “Ahh..” “No Mills, No!” begged Somerset. But it was too late. Mills fired his gun into the midget 8 times. One for each ingredient. Guest Bio: This article was lovingly written by the cavalcade of writers at Don’t You Hate Pants? If you’d like to read more about our particular sense of humor visit www.dontyouhatepants.net. We also have a Pantless Babe of the Week. She’s very pretty.